For breakfast this morning, I decided to spoil Jeremy and make him a batch of his very favorite muffins. 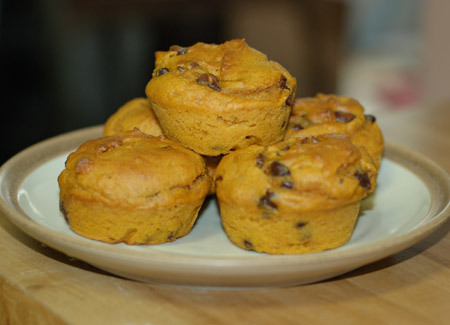 I’ve been making these pumpkin chip muffins for years, and the reason they are so good was originally a bit of a fluke. You see, the first time I made the recipe, I meant to cut it in half for just the two of us, but I accidentally used a whole can of pumpkin. I decided to try baking these double-pumpkin muffins anyway, and they came out incredibly moist and tender; I’ve been making them that way ever since, along with a few other adjustments, such as a decrease in oil. Jeremy is always requesting these muffins, to the point where I started getting a little bored making them. If I put off making a batch, though, he just goes in the kitchen and makes them himself. They are never quite the same as when I make them, though, and I think the difference may just be a lighter touch with the whisk. So take this as fair warning: once you start making these muffins, you may not be allowed to stop! Preheat the oven to 400F. In a large batter bowl, beat the eggs and mix in the pumpkin, sugar and oil. Meanwhile, in a smaller bowl, mix together the flour, baking powder and soda, cinnamon and salt. 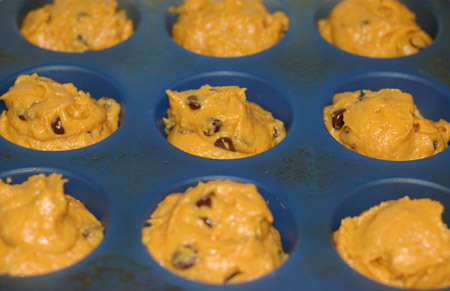 Whisk the dry ingredients into the wet ingredients just until combined, then fold in the chocolate chips. Scoop into a prepared muffin pan (I use a silicone pan and a cookie scoop for this) and bake for 17-20 minutes, until tops are starting to brown and spring back when pressed, or an inserted toothpick comes out clean. Makes 12-15 muffins. These are fantastic warm from the oven, but remain nicely moist for several days, if you can restrain yourself. My husband usually asks me to double this recipe, so we get the extra-large cans of pumpkin. Update 7/8/08: I made a fresh double batch of pumpkin muffins for Jeremy last night, and made a few minor adjustments for health’s sake. I used half white whole wheat flour, and subbed a quarter of the sugar with Sucanat. Two tablespoons of the oil were also flax oil, although I don’t know whether the baking process would destroy the health benefits of it. They were just as delicious as always, maybe even better, so I might push them a little farther in that direction next time. Update 8/31/10: We have been having a hard time finding pumpkin at the store—bad harvest last year or something. Maybe it is back in stock now, but we keep forgetting to check. Meanwhile, Jeremy has been sorely missing his pumpkin muffins, so I tried an adaptation using a 15-oz combination of roasted sweet potato and steamed Gala apple puree. The muffins came out flavorful and moist, and you wouldn’t know they didn’t contain pumpkin unless I mentioned it. Very good to know!